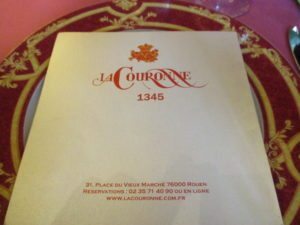 La Couronne in Rouen, France- Auberge La Couronne in Rouen on the du Vieux Marche was established in 1345. A long roll of parchment dating from 1364 provides the authenticity of the deeds. It was a tavern providing food and drink to weary travelers and locals alike. 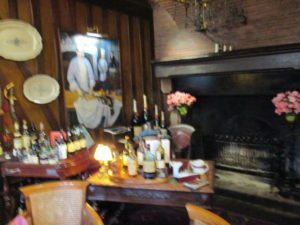 It is regarded as being the oldest restaurant in Europe, however its early beginnings included a tavern, so some argue it is not the first “restaurant” per se. The dilemma continues. 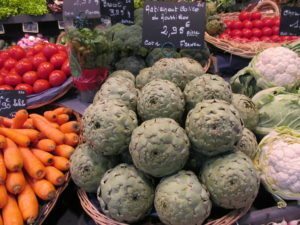 A daily Farmer’s Market can be found just across the plaza, and the church where Joan of Arc met her fate is also a landmark here. Guests enter on the main floor to a charming waiting area. And descending five short steps, guests arrive into the dining room, which reminds me of being on a large wooden ship. The wine cellar is just below in the basement and the kitchen is toward the back of the building. A steep set of steps and wooden railings leads to the second floor where private rooms can be found, and the restrooms. The third floor is offices and storage. I can just imagine the early days when there were tiny guestrooms on the second and third floors. 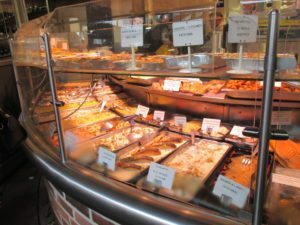 Like many Chefs, Pascal began his love of cooking with the exploration of ingredients, dairy from the farm, seafood from the ocean, and the loving hand of his mother tending to his techniques with her adept nature in the kitchen. 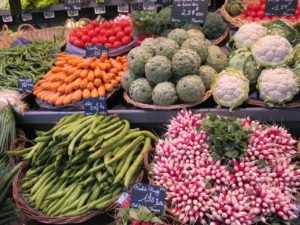 Born in Normandy, France and like many chefs in Europe, it is all about apprenticeships in the kitchen. Pascal’s his first jobs were in the top kitchen of his home town of Rouen. 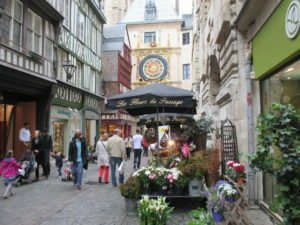 This included, Hotel de Dieppe and La Couronne in the heart of the old city. 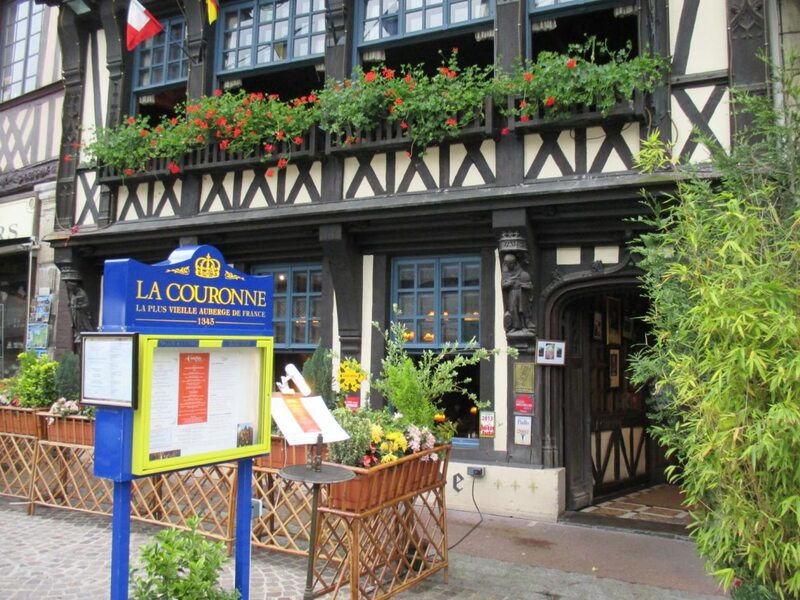 La Couronne also happens to be the first restaurant Julia Child visit when she and her husband moved to France. She enjoyed the Sole Meuniere by the way. 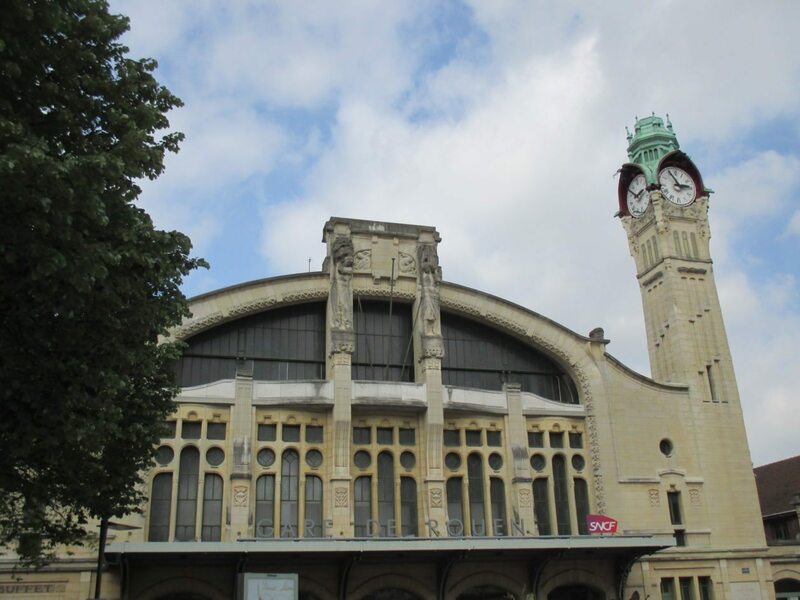 Pascal kindly arranged for our reservation and we took the train up from Paris. 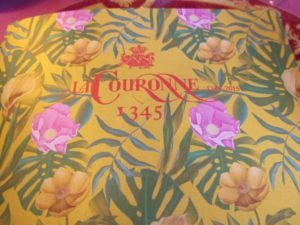 It only took an hour and a half and we were able to easily walk from the train station to La Couronne. Scooting past the Rouen Cathedral where Monet painted the monument in every imaginable season (1892-93) is always a delight to see. I note the window across the plaza from which he sat and painted the structure in all its splendor and dramatic lighting. Pitter, patter past the Tower Clock and to the restaurant. 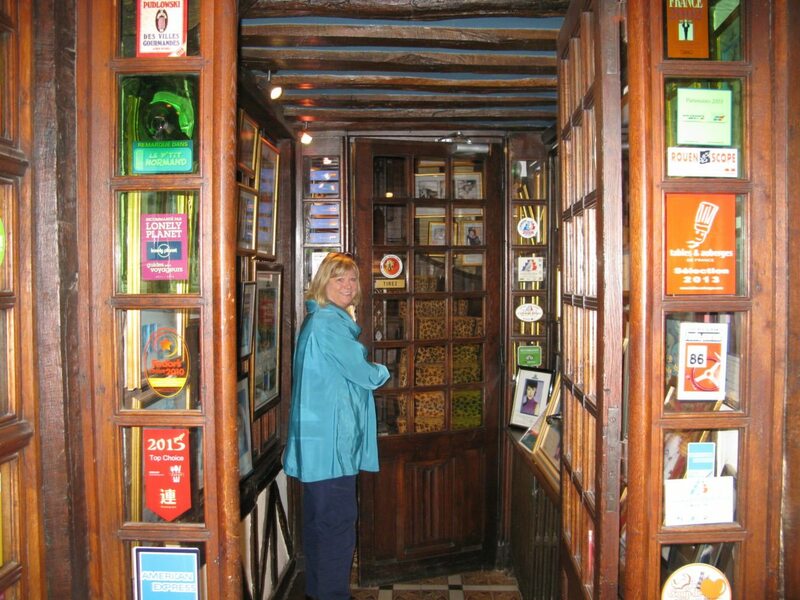 We enter the restaurant at lunch time, and are the first patrons to arrive. We are graciously welcomed and seated by the window at Table #4. Perfect for my picture taking, and I have a view of the entire dining room. At the far side, I notice the owner in a lovely suit with her sweeping blonde hair framing her face. Her perch is an elegant wood carved table tucked in the corner where she conducts business and my guess keeps a close eye as to the goings on. As we ordered our cocktails, the room began to fill quickly. An adorable set of ladies were seated, and the sat on a small couch side-by-side. They chattered away, and it was adorable to watch. A couple entered with their beloved dog, and he quietly slid under the table at the feet of the owner. (Luckily my dog was not there or he would have been barking like crazy!) 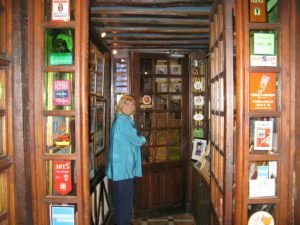 We began with an Apertitif d Marque Compari and a Cosmopolitan to toast our voyage to one of the oldest restaurants in Europe and to Pascal. 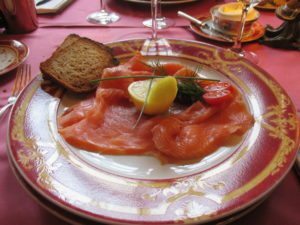 The Escalope de Foie Gras and a Saumon fume aux bois de hetre (smoked salmon). A lovely start. Mixed Grill de Poissons Fins was next. 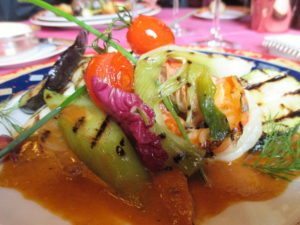 This was grilled shrimp that was extremely tender and flavorful, with grilled zucchini and a rich sauce. It was so colorful, the plate danced. 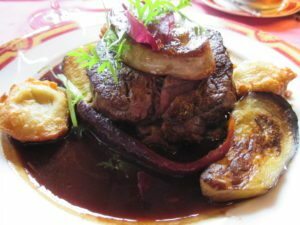 A glass of Verre de Chablis accompanied our entrée’s, the special of the day, Salmon and the Coeur de Filet de boeuf (beef fillet) with a Cabernet reduction. 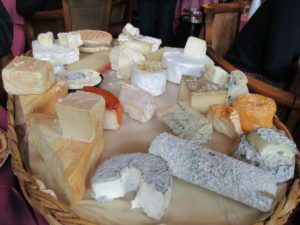 We shared both, and just stared at the cheese tray with at least twenty different cheeses. 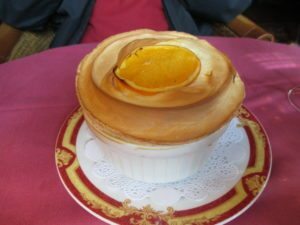 Yes, the Grand Marnier Souffle de Normandy was calling our name. It was light and delicious. They prepare their souffle’s slightly undercooked I notice in France. But it was wonderful. 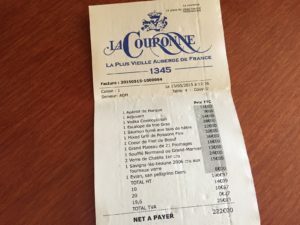 The bill was 222 Euros, including gratuity. 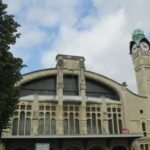 It was such a memorable day, as we made our way back through the downtown area and back to the train station for our return to Paris. 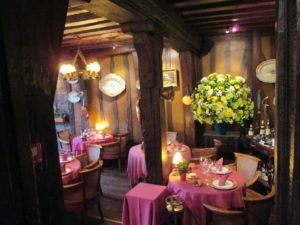 While public eateries existed in Ancient Rome, Greece and Sung Dynasty China, restaurants, we know them today, are generally credited to 18th century France. The genesis is quite interesting and not at all what most people expect. 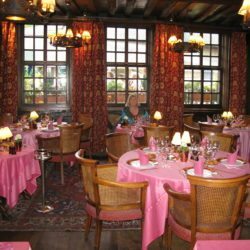 Did you know the word restaurant is derived from the French word restaurer? That means to restore. 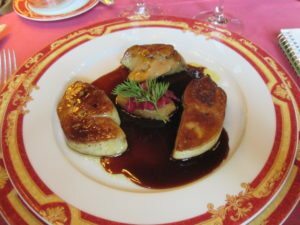 The first French restaurants (pre-revolution) were not fancy gourmet establishments run by ex-aristocratic chefs. They were highly regulated establishments that sold restaurants (meat based consommés intended to “restore” a person’s strength) to people who were not feeling well. Cook-caterers (traiteurs) also served hungry patrons. According to the current edition of Larousse Gastronomque (p. 194-5), the first café’s (generally defined as places selling drinks and snacks) were established in Constantinople in 1550. It was a coffee house, hence the word “cafe.” Cafes were places educated people went to share ideas and new discoveries. Patrons spent several hours in these establishments in one “sitting.” This trend caught on in Europe on the 17th century. When cafes opened in France they also sold brandy, sweetened wines and liqueurs in addition to coffee. 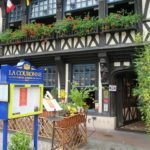 The first modern-type cafe was the Cafe Procope which opened in 1696.
Who started the first true “restaurant” in its current form? There are many answers to this question…. 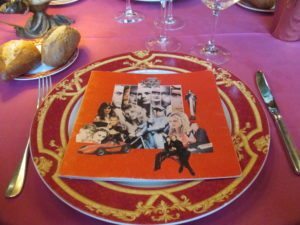 In the form of a restaurant, the dining institution is specifically a mid-18th century French invention, as first documented by gastronome Jean-Artheime Brillat-Savarin (in The Physiology of Taste) in 1826. 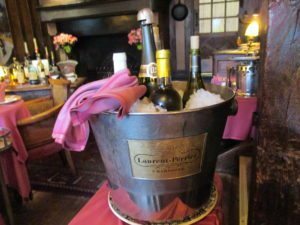 As late as 1851, two thirds of the French provincial departments reported that they had no restaurants, as inns and wine shops were not considered in the same category. 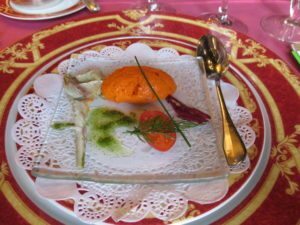 It was not until the post-Revolutionary France in the 19th century when restaurants and the middle class brought “haute cuisine” to the masses. During and after the Revolution, many chefs traveled to England and the New World, spreading their culinary expertise and sensibilities of hospitality. 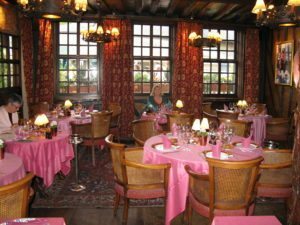 London often followed Paris fashion and an engraving shows a restaurant displaying an elegant vaulted room hung with Venetian mirrors and stucco swags in London. The first restaurant in London is Rules (established in 1798 by Thomas Rule), which is still in existence today. The gilt and red velvet interiors of the Grill Room at London’s Café Royal, is another classic, and is still in operation today. In New York, coffee houses evolved to gentleman’s clubs, and Delmonico’s was the toast of high society in the late 19th century. 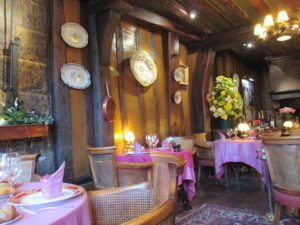 The restaurant was decorated in an elegant, French style and began as a small pastry and confectionery shop owned by two Swiss brothers. And there you have it….a wonderful day…. and back to Paris!